The iGrip Ergonomic Keyboard is currently out of stock. We do not know if and when there will be another production run of the iGrip. We are working on a next generation AlphaGrip, but cannot currently project a launch date with any degree of accuracy. To reserve an iGrip from the next production run and receive a $30 discount off the $129 retail price or if you would like to receive information regarding the development of the next gen AlphaGrip, email support@AlphaGrip.com with “Contact” in the subject line and we’ll be in touch. Please note that standard shipping and handling fees are $10 to a mainland U.S. destination, $20 to Hawaii, Alaska, and Canada, and $30 elsewhere. 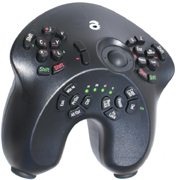 The iGrip Ergonomic Keyboard is a superior alternative for the human-computer interface. It enables high speed computing while sitting, standing, leaning back, or lying down. When holding an iGrip, your hands are positioned in a comfortable vertical orientation while your fingers naturally fall on keys located on the back of the device. See for yourself as the iGrip is demoed by a teen in a recliner, by the inventor on a laptop outdoors, gaming on a flat screen TV, setting the world record for texting on a handheld device, and literally on the run.